Discussion in 'Developer Diaries' started by Viserys, Dec 8, 2016. Like Hexodious mentioned in this post, we at the MBII team are hoping to change the MBII direction to be more focused to new features rather than re-inventing the wheel by continuously editing existing features. After all, as a wise saying goes, "if it's not broken, don't fix it!". With Rogue One approaching, this is an excellent opportunity to pull up our sleeves and start implementing a number of features that have been in our drawing board for far too long. To do this we aim, as Hex said, to first freeze the Jedi/Sith lightsaber mechanics for the foreseeable future, something that we are currently working on. We are excited and enthusiastic in working on these new things, but unfortunately our enthusiasm is not enough to make wonderful MBII things happen. As you know, MBII development is entirely voluntary and depends greatly on everyone's free time and availability. Our current resources are limited so completing all of these features will take a very long time, or may not happen at all. That's why we need your help! We are looking for members of our community to support our efforts and help us realize our dreams for significant upgrade to MBII, by joining the Development Team with the aim of working on these specific features. UI designers, to help re-vamp the current UI as needed (e.g. to include new classes) and improve performance. 2D and 3D modelers and animators, to help with the models for the new classes, and help creating or adapting new models for upcoming films. Coders to work on the new game modes and the new classes. Mappers to work on unfinished map projects and create new maps based on the upcoming films. Support and promotion partners, to help with the influx of new players after Rogue One is released, and hopefully keep most of them as permanent MBII junkies! Beta Testers! As you all know, bugs are everywhere, so help us obliterate them before releases! Also, the development of new game modes greatly depends on having enough testers to properly test them under normal game play conditions. The modes cannot be developed without testers. Specifics for the requirements of Developer positions can be found here. If you have the required skills, or are willing to learn, apply! For Beta Testers, the details are here. You have no excuse not to apply, as you don't need to have a specific skill other than love for MBII! We look forward to hearing from you, as you awaken with us! May the Force be with MBII. Jameson, Jiube, handzummest and 16 others like this. The beta tester link is broken. No permission to view. Was that a test? Yeah we humble regular users don't have permissions to view either of those last two links. GASHTI, TadekRaeod, Prototype XT81 and 1 other person like this. Sorry guys my organizational obsession got the best of me. It should work fine now. A Super Battle Droid re-vamp. Exactly what you said would not be happening in your first paragraph. I am not in favor of this re-vamp, I find slow walking to be an important part of being a Super Battle Droid. Slowly walking toward a scared jedi is a wondrous thing. I don't like this update already..
GASHTI, Jameson, ElderMurloc and 3 others like this. the "Our team is looking for new blood... could it be you?" thing in Community Discussion also has a broken link. edit: @Goliath-A.I. ha ha you'll have to make like a human and "adapt." don't worry, it's not like they'll make SBDs garbage. You can still be a terror. You can still be a terror. We can only hope your words will hold true pathetic mortal. We can only hope. Jameson, ElderMurloc, President Bossk and 1 other person like this. This sounds good Im excited to see what you guys come up with. Looks great. Can't wait until the population influx! By running I think it's more along the lines of making it less of a "wobbling penguin tank". Spaghetti, TadekRaeod, Darth Pujge and 2 others like this. Also really wanna learn about these new classes, sounds intriguing. So I'm not the only one who found our running animation to be similar to that of a penguin's. GASHTI, Mechaelite, ElderMurloc and 3 others like this. for anyone wondering, here's some (video footage of) official walk AND run animations for the movie SBDs. it would be kind of interesting is there was kind of acceleration/deceleration to the running, or a kind of switch in and out of "running mode," so you'd see an SBD barging down a hall but when it got to where it wanted to be it would need to take a second to decelerate. Having momentum like that would keep it from just being another fast class, keep it a bit vulnerable by reducing the unpredictability of its movement a little. I guess I'm thinking it could move more like some of the vehicles or a tank from some classic tank game, where you use W and S to adjust your speed value up and down. Momentum. In practice this would lead to kind of funny scenes of SBDs sprinting in circles because they want to stay in one place without decelerating. edit: although people with very high mouse sensitivities would have a much easier time dodging if it were like this. You could go all the way and make SBD a "vehicle" like Dekas are, if that's what's necessary to add a cap on maximum turn-speed. But at that point, I guess SBD starts to be too similar to Deka (fast moving but non-agile tank). I'm just running ideas here. Mechaelite and SK55555555555555555 like this. Don't freak out yet. We have some cool stuff planned (if it ever gets implemented) that I think most SBD fans will enjoy. No promises, though! "If it's not broken, don't fix it." The Super Battle Droid is a defensive class droid, slow and powerful. The loud metallic sound of a SBD's march is meant to instill fear into the hearts of organics. When a pack of jedi see a SBD standing alone in a hallway, I want them to still seriously consider running for their lives. 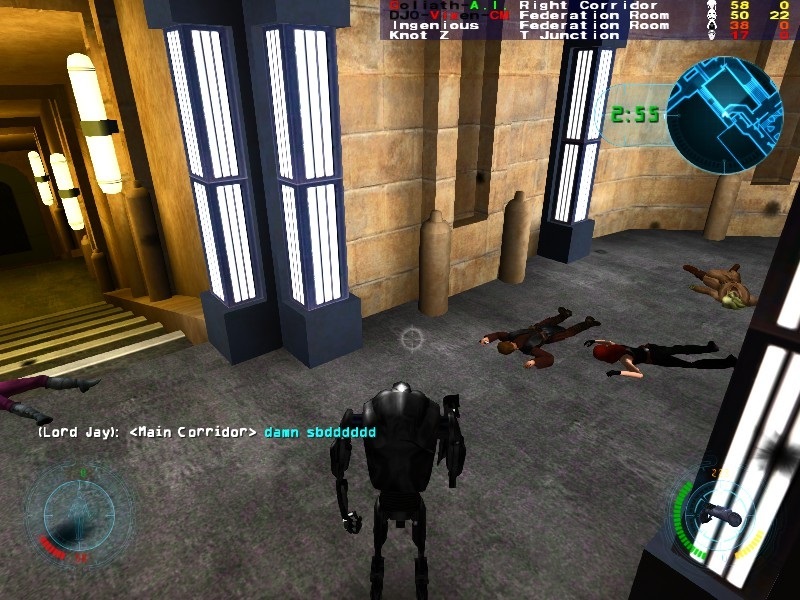 The Super Battle Droid isn't meant to be running and ducking behind corners like an acrobat. We are the very image of defensive power. Our builds allow us to adapt to any situation, from melee wookiees to Jedi and even thermal detonators. In our current state though, we can not survive offensive approaches, which balances our power out. Notice how you will never find me charging into battle, but rather holding a defensive position. I treasure re-creating the scene below every time I enter a battlefield. GASHTI, Jameson, Omegaaaaaa and 6 others like this. It is broken.... nuff said. Jameson, Jiube, Mechaelite and 5 others like this. A buff is better than nothin'. Edit: Just noticed the words "re-vamp". I'm scared. Those words only remind me of the many nerfs devs have called "re-vamps" over so many different games. God save the SBD. Goliath-A.I., Mechaelite and President Bossk like this.